Help CentreUsing SuperControl Managing enquiriesHow do I generate and send a quote by email? 1. 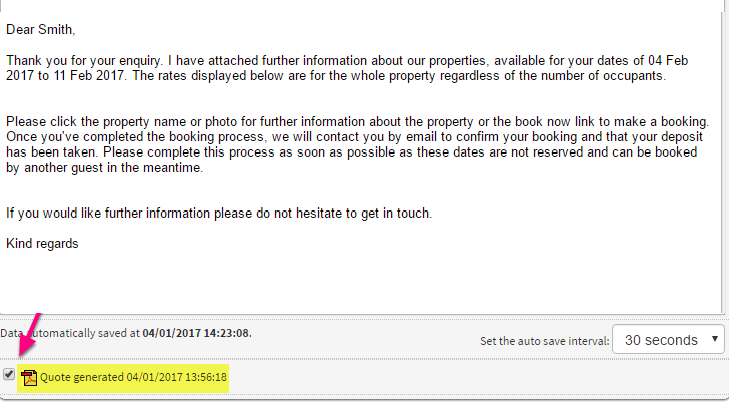 Having generated a quote (see How do I add an enquiry? ), you will want to send the quote by email to the guest. At the top of the Enquiry page you have a Form letters section. From here you can select the correct letter to generate your enquiry. Make sure that Email is selected, then click the "Generate" button. 2. A preview window will appear, allowing you to preview the email before you send. 3. You have three options to include in the quote. The first option is to attach the PDF to your email. You will find this option just above the send button at the bottom of the screen. You must tick the box "Quote generated" for the PDF to attach to the email. 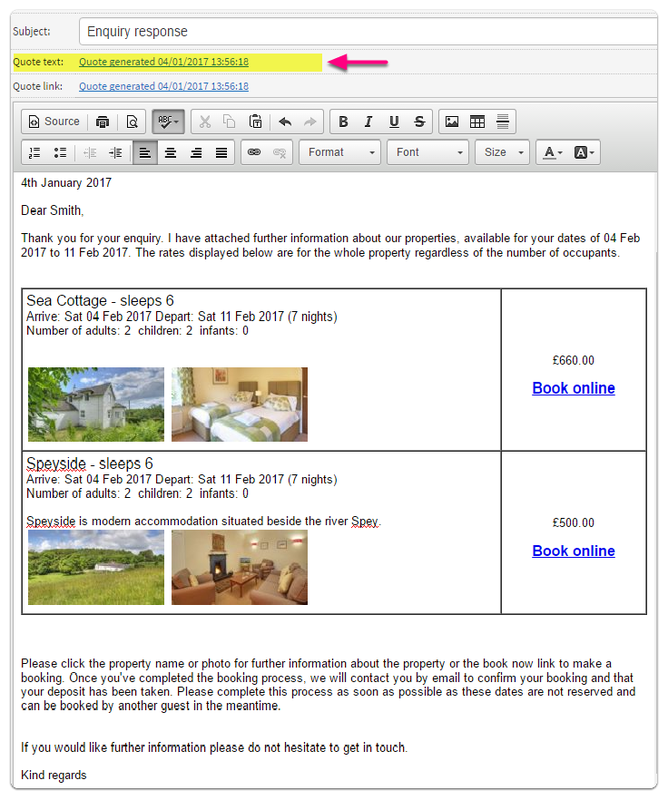 The second option allows you to include the quotation details in the body of the email. Simply place the cursor into the email where you would like the quote to display. Click on the "Quote text" link. 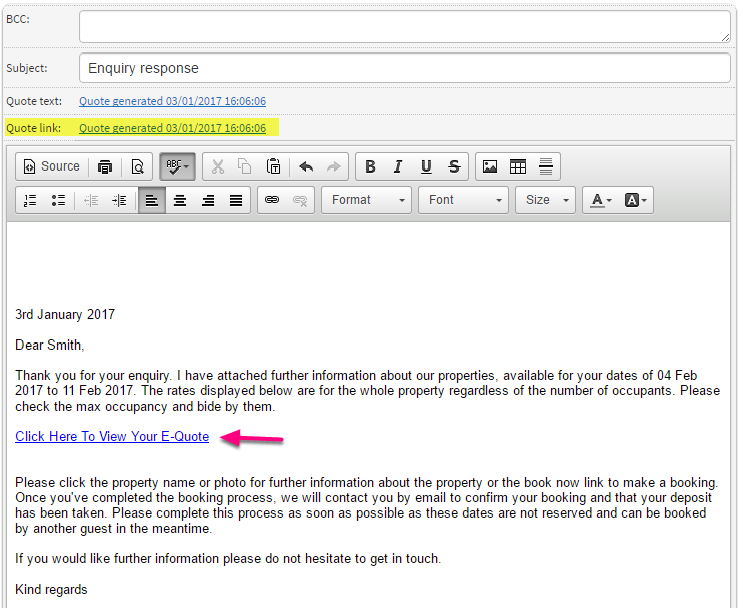 The third option allows you to insert a link into the body of the quotation email. To do this, select where you would like the link to be inserted. Choose the "Quote link" option (see below). Please note the quote link is recommended as it takes the guest to a design matched page. The quotation link is also better if you are quoting for several properties. 4. Once you have chosen your preferred method, scroll to the bottom of the page and click "Send" to send the email. Any emails sent will display in the Notes section. You can refer back to this if you want to see what emails have been sent. Prev: How do I edit an enquiry? 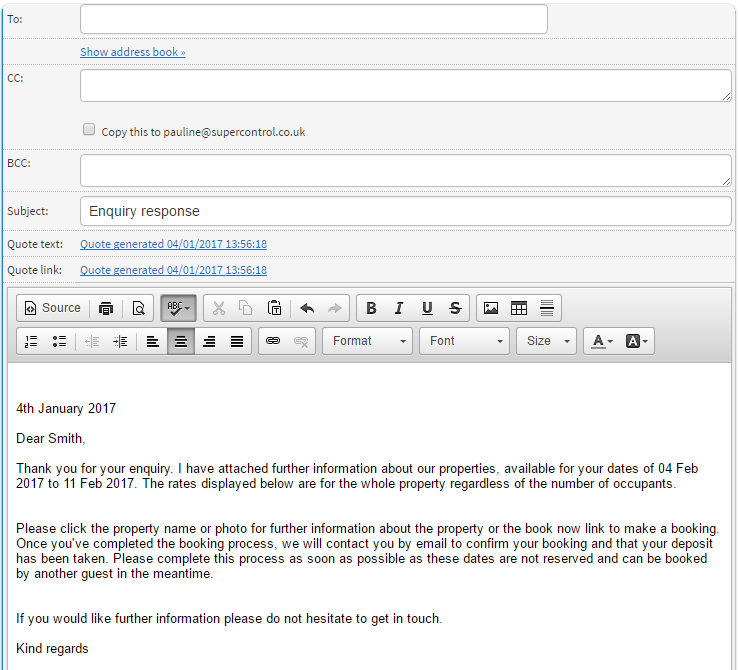 Next: How do I set-up how my property photos display on a quote?